"PJ Masks all shout, "Hooray" because in the night, we save the day!" 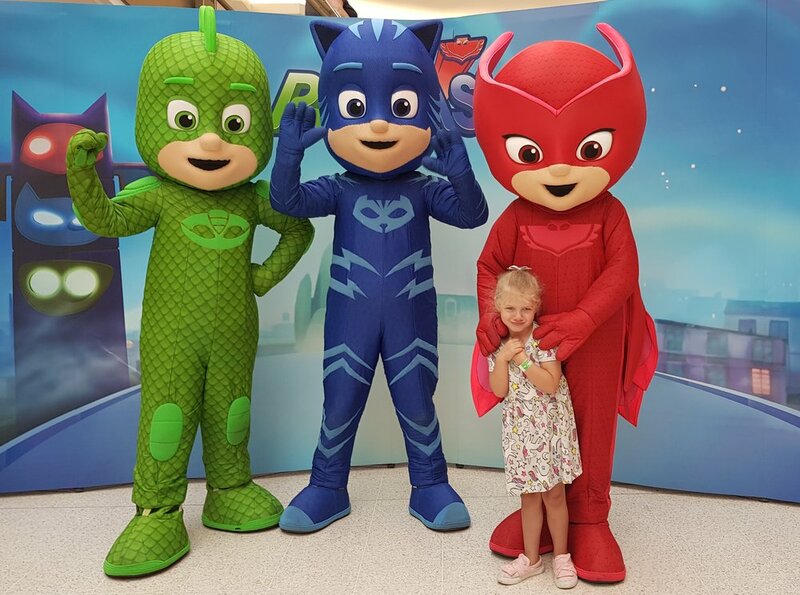 Throughout August the PJ Masks are visiting Intu shopping centres and we had the fabulous opportunity to visit and join in their Hero Training Academy at Intu Watford. Although the event is now over in Watford there are other visits happening very soon, so check out the Intu website to see when they're at your local centre. On arrival the girls were given PJ Masks wrist bands and we were shown into the area where we were to take part in the event, both to get some hero training and also meet the PJ Masks. Squidgy was a bit shy at first but pretty soon was getting into it, doing all the actions and learning all the moves, her favourite though, (of course) was Owlette. Each character came out one by one to meet the children and teach them all the special moves, such as Catboy's super cat speed and Owlette's super owl wings. Gekko came out and hid behind the presenter and all the children laughed and had so much fun, especially Squidgy who said it was a little like a panto. When it came to photographs at the end every one queued up and were ushered through so quickly, which was a bit of a shame as I'm sure other parents like me had their children expecting to be able to say hi and had a chance to "meet" the characters rather than just stand for a photo; but all the same Squidgy was happy to have a cuddle with Owlette and pose with her dad too! At the end of the event every child was given a goody bag, to say thank your for coming. Of course the chance to wear a PJ Masks mask of their favourite character had both the girls smiling, even Pickle kept it on for longer than half a second (which has to be a record!) It also included stickers, a colouring sheet and a certificate congratulating them on completing their hero training. We were so glad we had the chance to visit the event today, and that the rain held off for us to be able to walk there and back. 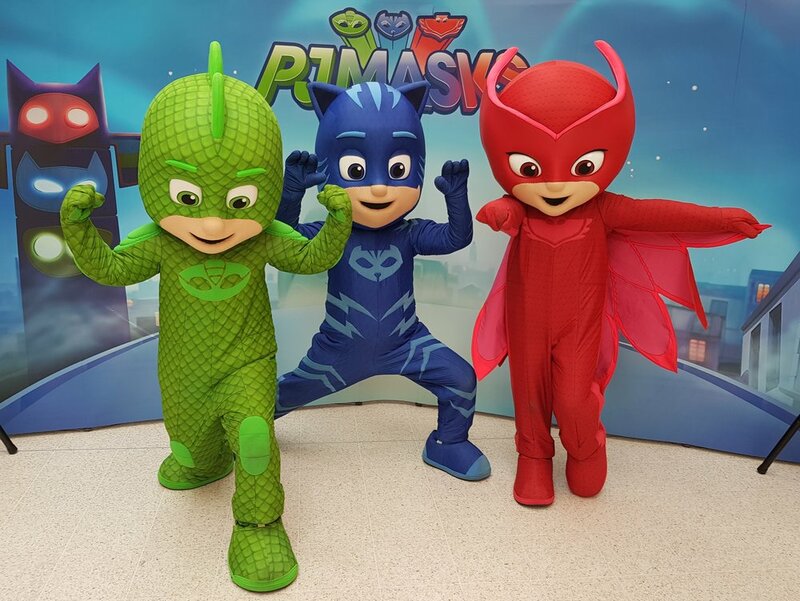 There are more opportunities to see the PJ Masks at other Intu shopping centres, starting with Uxbridge tomorrow (Thursday 16th August) so be sure to have a look on the Intu website to see when they're at your local centre. With thanks to Intu Watford for inviting us to #discoverIntuWatford and attend the PJ Masks event there today. Read on to discover what Coral Island has to offer, and why it's the perfect UK day out with kids. Here are the top reasons why you should book a holiday to Cyprus this year, just like my honeymoon. Hollywood Bowl invited us to the VIP event for the new Intu Watford branch, here's what we thought. Everyone loves online shopping but I don't think anything can beat visiting our local Intu centre. Here are some of my favourite highlights of both Coral Reef Waterworld and Zoggs' event held there. Check out our experience of Rock Up Watford and why I think it's a great day out for all the family. Here are some of the more obscure places on my travel bucket list, I would love to visit one day. Read all about our special day spent at Woburn Safari Park, seeing the animals and exploring.